Though the US Open has been hosted at its current complex for 50 years, the tournament itself has been going on since 1881, meaning there’s a rich backstory about where and how America’s Grand Slam has evolved. This year marked a new chapter in the tournament’s history as the new Louis Armstrong Stadium opened for play, ending a five-year renovation project of the site’s currently facilities. 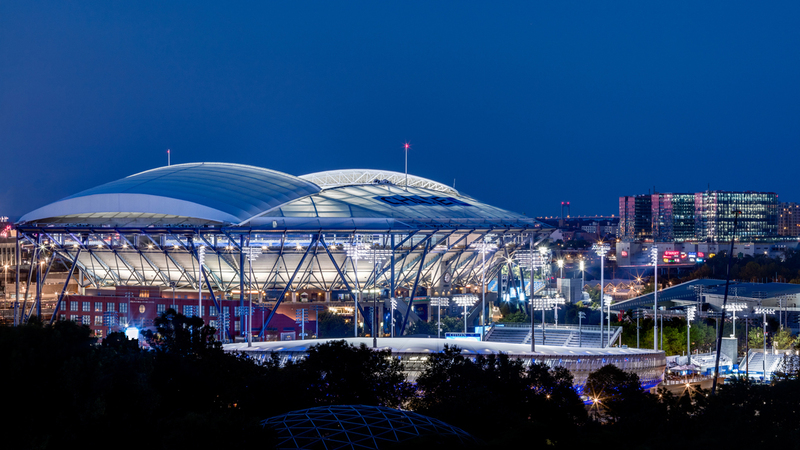 Here’s a brief history lesson in the architectural layout and legacy of the world-renowned United States Open Tennis Championships. Luckily for tennis lovers, all of these spaces are still playable today. Perhaps the oldest and most prominent tennis facility in the United States, this ancestral home of the US Open welcomes players from all over the world to its historic grass courts and Victorian-style clubhouse. Formerly named the Newport Casino, the facility was designed by McKim, Mead & White in 1880 and was the center of the city’s society in its heyday. Upon opening, it hosted the first U.S. National Men’s Singles Championship in 1881. When the tournament outgrew its Newport location in 1914, it was relocated to the West Side Tennis Club in Forest Hills, New York, eventually evolving into what we know today as the US Open. When the site was in danger of demolition in the 1950s, it was repositioned as the International Hall of Fame and later became a National Historic Landmark in 1987, preserving a shining example of American shingle-style architecture. 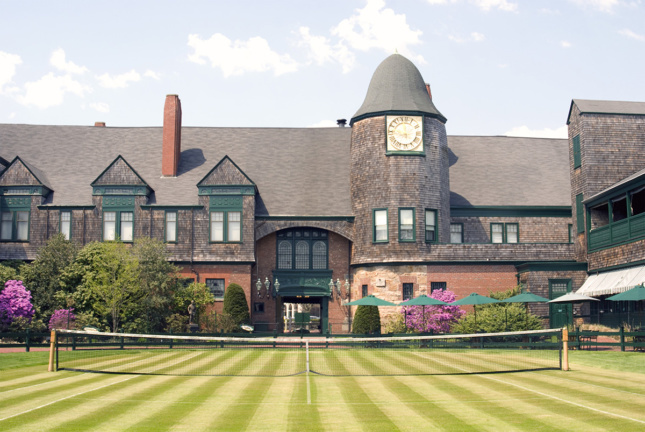 This 125-year-old tennis club was founded not long after the Newport Casino opened in Rhode Island. Established in 1892 in its original Upper West Side location, the club built out its current facilities in Forest Hills in order to accommodate its growing membership. 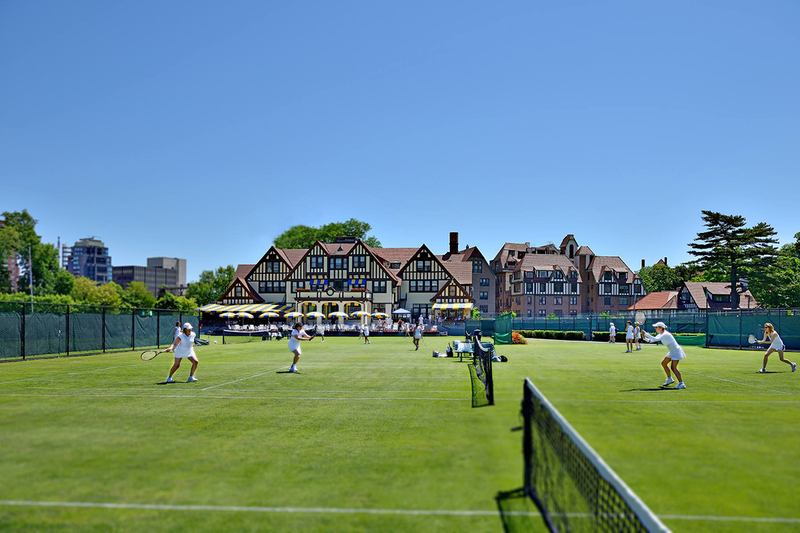 The grounds were set within Forest Hills Gardens, a 175-acre community designed by Frederick Law Olmsted, Jr. Overlooking the courts is a stunning Tudor-style clubhouse built to complement the surrounding Georgian and Tudor homes. The United States Lawn Tennis Association National Championship moved the tournament to the West Side Tennis Club in 1915, where it continued every year until 1977. Today, the club boasts 38 tennis courts of varying surfaces including grass, hard, red clay, and Har-Tru, as well the 13,000-seat Forest Hills Stadium, the country’s first arena featuring a concrete facade. Today, the stadium hosts a celebrated summer music series along with other arts events. A junior Olympic-size swimming pool and paddle tennis courts are also included on site. Located three miles north of the West Side Tennis Club, this 46.5-acre complex has been the current home of the US Open since 1978. It was initially called the USTA National Tennis Center but was later rededicated in 2006 to women’s tennis champion Billie Jean King. 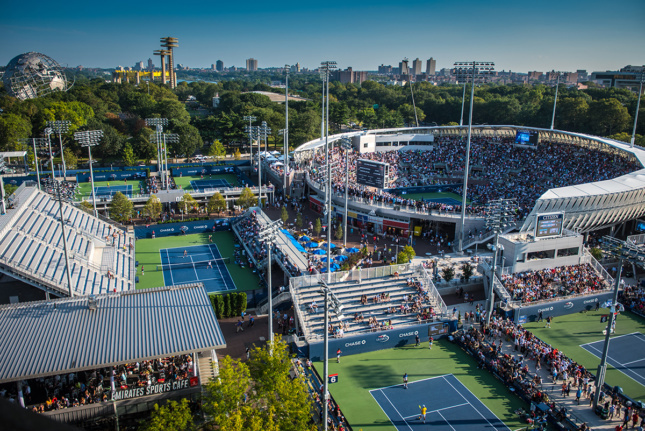 The campus is set within Flushing Meadows–Corona Park and today features 33 courts including three mega-arenas: Arthur Ashe Stadium, Louis Armstrong Stadium, and the Grandstand. The latter two structures exclusively held the Open matches until Ashe was built in 1977. After rain delays majorly halted play during from 2008 to 2012, the USTA created a master plan to rebrand and solidify the entire complex ahead of the tournament’s 50th anniversary in 2018. This $600 million overhaul included demolishing the 54-year-old Armstrong Stadium, which was originally constructed as the Singer Bowl for the 1964-65 World’s Fair. A new, 14,000-seat structure was built from scratch in its place, opening this summer just in time for play. The multi-year renovation project, led by Detroit-based firm ROSSETTI, also included a new show court for the 8,000-seat Grandstand featuring a translucent skin that wraps around the facility. 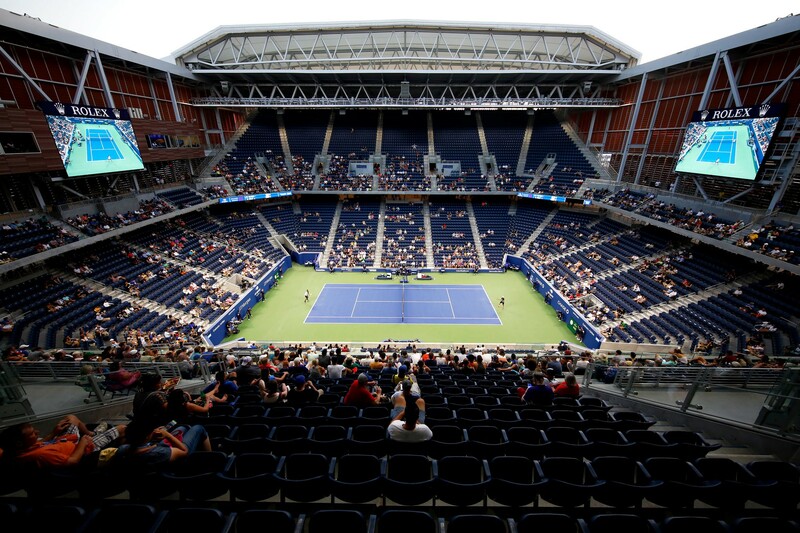 Most notably, two new PTFE retractable roofs now top Armstrong and the 23,771-seat Ashe Stadium where the major matches are held. The flexible roofing systems, which can open and close in five to seven minutes, now allow games to go on rain or shine.